Ruthless is a candid exploration of the criminal subculture of Wall Street, and one of the first books to speak for the victims of the financial meltdown. On February 14, 2008, author Phil Trupp received a call from one of his brokers telling him a large portion of his investments were frozen—on ice—turning his life and plans for retirement upside down. When the fog started to clear, Trupp realized he was one of many investors caught up in what experts called the greatest attempted securities fraud in modern Wall Street history—a $336 billion scam which made the savings and loan scandal of the 1980s look like a simple street mugging. The path to destruction, financial or otherwise, often begins with a simple proposition. For author Phil Trupp it came from one of his stock brokers: "Take it, Phil. It’s free money." This free money came from auction-rate securities (ARS). Auction-Rate Securities are corporate or municipal bonds with a long-term maturity for which the interest rate is reset at frequent auctions. ARS interest rates were higher than money markets and were sold as completely safe, liquid, Triple-A rated "cash equivalents," a deceptive sales pitch that lured hundreds of thousands of investors to buy the securities. Since 2008, most auctions have failed leaving the market largely frozen. The victims ranged from individual investors to the Joffee Foundation, a nonprofit that can no longer fund programs that help prevent AIDS in Africa, to the Port Authority of New York. While this is a classic 21st century tale of Wall Street greed and betrayal, it is also a story of redemption and the life-altering struggle of American investors and others around the world who, in the end, beat the Wall Street fraud-masters. 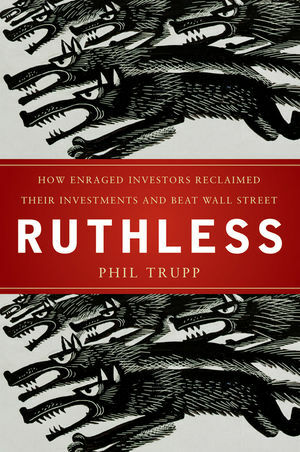 Ruthless is a story of how individual investors became mad as hell and joined together to reclaim their cash investments. So far they’ve reclaimed more than $200 billion and continue fighting for the rest. A lively, page-turning guide for any investor with a stunning lesson on how to fight back and win. PHIL TRUPP is a veteran investigative journalist, and the author of many books, including Sea of Dreamers: Travels with Famous Ocean Explorers and Tracking Treasure: Romance & Fortune Beneath the Sea and How to Find It! He is also a regular commentator for New York Times Dealbook and New York Magazine Online, as well as a weekly contributor to www.auctionratepreferreds.org, the Internet's top site on auction-rate securities (ARS). Trupp was assistant bureau chief of Fairchild Publications/ABC CapCities, where he covered the White House, Pentagon, Supreme Court, Treasury, NASA, and the Federal Reserve, and, today, lectures on "The Future of Journalism" at American and Georgetown Universities. Chapter 1: "Deal With It!" Chapter 2: The "Back Nine." Chapter 3: A Sweet Deal—Until It's Not. Chapter 4: "I Have No Dreams." Chapter 5: Bill Meets Mohela. Chapter 6: Power to the Blogosphere. Chapter 8: Armies of the Unseen. Chapter 9: Day of Deliverance. Chapter 10: The Newton Factor. Chapter 11: Harry the Hit Man. Chapter 12: The Raymond James Caper. Chapter 13: What's It All About, Barney? Chapter 14: Stretching to Meet the Man. Chapter 15: State of Play 2009. Chapter 17: Hopeful Signs from the Hill. Chapter 18: Going to Meet the Man. Chapter 19: The View from Here.